I have been up and down Green Lanes enjoying the new finished parts of the cycling infrastructure and public realm improvements. Sometimes I go with a camera, but sometimes not – and it was without a camera that I saw a dad with a very young boy, perhaps 7 or 8 years old, riding on the cycle lanes and through the Ridge Ave/Church St junction. By the time I found my glasses and phone they had disappeared towards Green Dragon Lane, where the cycle lane finishes. 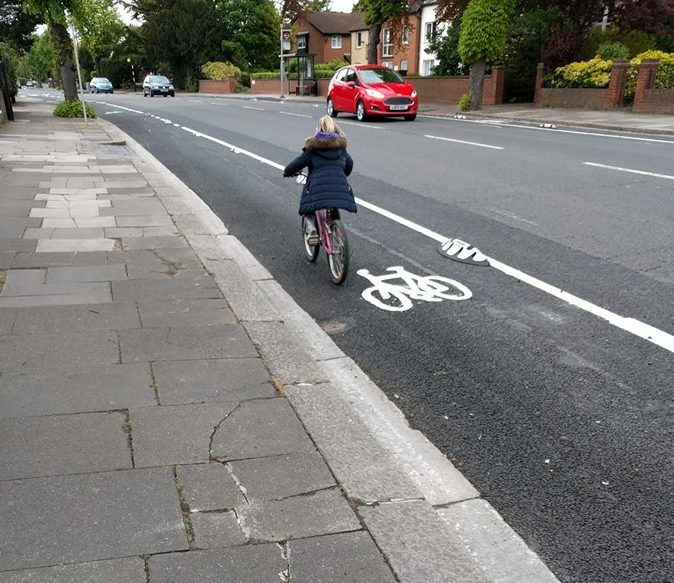 It was a lovely sight and a taste of things to come – people of all ages feeling safe to cycle on this road. The real problem at the moment is that bits have been finished, but they are not joined up. The bits that aren’t finished are horrible, as the following video shows. VIDEO Nice to see a woman in normal clothes on a bike. 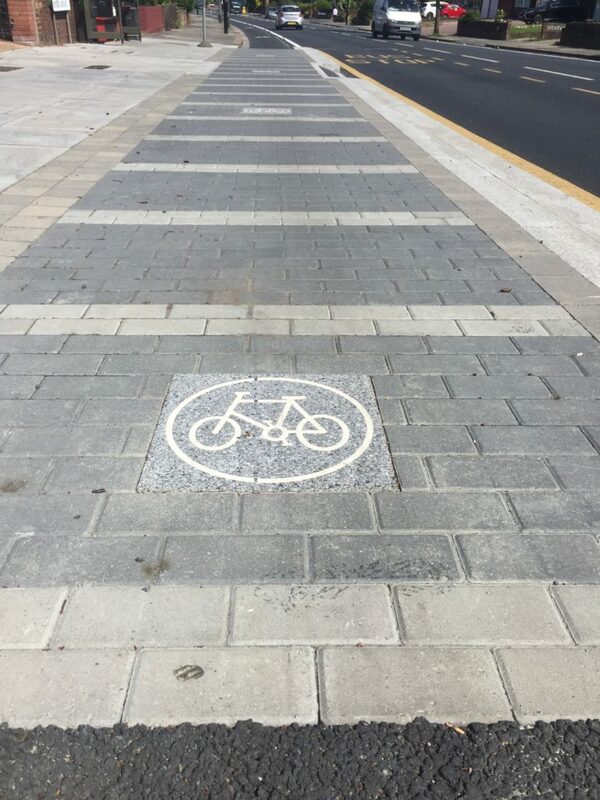 Critics have been asking, “Where are all the cyclists?” but while the completed parts aren’t joined up, it’s no wonder there hasn’t been a modal shift to cycling overnight. Work is literally happening at both ends now – the junction at Bush Hill near Enfield Town is coming along, as well as the junction with Palmerston Crescent in Palmers Green which marks the southern end of the cycle route. Work should be completed at Winchmore Hill soon, once the ‘triangle’ at Compton Rd is moved to create more parking. Concentrating on Winchmore Hill – it has two junctions finished and the lights are operational. Initially, the lights at Station Road were causing tailbacks up both side roads. This is a problem for the council, as the phasing is controlled by Transport for London, who have to send out an engineer to assess the lights. So while I got an incredibly quick response from the council (16 minutes!) saying it was being dealt with, TFL took slightly longer, at just over a week or so, to sort it out. Note that these lights are not “on demand” (set off by a sensor)for cycles as they are part of the normal north to south cycle route. There is a button to your right at this cycle crossing, and a kind gentleman shouted at me to press it to speed up my journey. 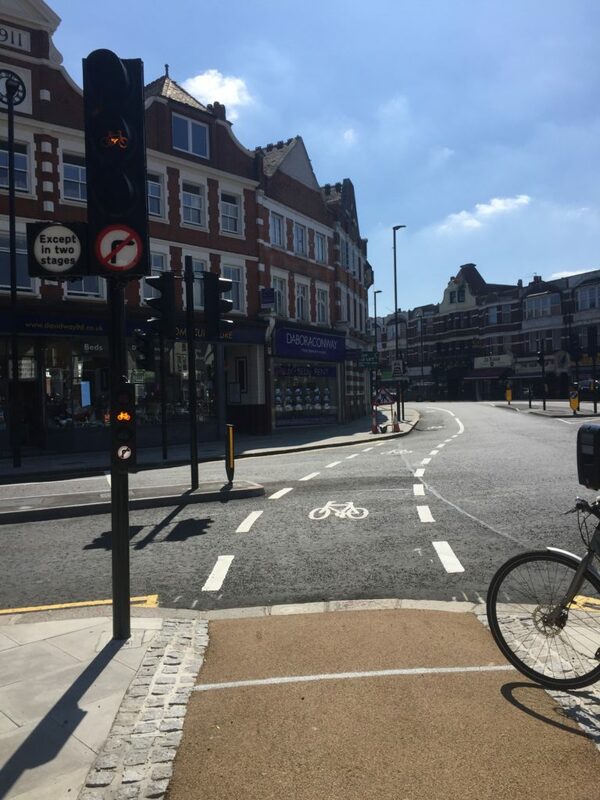 As for pedestrian crossings, between here at the lights going southbound and the other south east side of Green Lanes – well there isn’t one. People were using the cycle crossing, which isn’t a problem if it is quiet, but we really need at least a dropped kerb at some point, possibly further towards Coffee Break. This has been added to our snagging/feedback page. The advance green light for the cycle lane outside Sainsbury’s works well as a cyclist, designed to only go green when a cyclist arrives. The sensors are very difficult to set up to only respond to cyclists, and I think this one is a little sensitive – it goes green without a cyclist approaching it. I found this out as I drove a car through the lights. Note in this video how the driver of the silver car coming south gets confused and goes through a red light as the black 4X4 comes out of the junction. There are lots of complaints about cyclists doing this and that wrong on our new cycle lanes. Truth is, we are all people and we make mistakes or deliberately do the wrong thing – it isn’t dependent on your method of transport. However, if you make a mistake on a bicycle you are unlikely to hurt anyone else. I also re-visited the bus stop bypass around Park Ave as last time I took a video, there were some barriers obstructing sightlines. We have requested that the priority of the junction is visually improved by continuing the colour of the cycle lane across the road. Here is the latest version without the barriers – note that the camera is not at head height so the view (unless you are a six year old) is slightly better in real life. I know the bus stop boarders have been talked about as an area of potential conflict – so while I was out filming I was fortunate to see one in action. Save Our Green Lanes have stated publicly that people have been run over by cyclists and have broken bones as a result but I am taking that with a pinch of salt. To my mind the way we use these boarders depends on your level of experience. If you are a fast cyclist and don’t want to stop you can just safely leave the lane and over-take the bus as you would normally. I very much doubt you would want to speed over the boarder with a bus while passengers getting on and off – that would make no sense. If you want to stick to the lane you can just wait 10-15 seconds for the boarder to clear before continuing on your way. Note that this bus stop isn’t quite finished as there is an issue with barrier storage on the left – you might want to ‘hold back’ behind the bus so passengers can clear the path. VIDEO How to use a bus stop boarder – and a very short delay!